Arthur Murray, a Naperville-based dance school, is part of the internationally renowned Arthur Murray Dance Studios system. 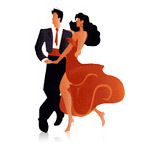 The Naperville franchise teaches hundreds of students each year with lessons in tango, rumba, salsa, ballroom, swing dance, cha-cha, and others. To schedule your complimentary first dance lesson, fill out our on-site contact form here.